I may not have all my ducks in a row but my eggs are another story. I’m not sure if there is anyone left around here to read these words but I think I will type them none the less. A 9 month absence must be enough to kill a blog, especially a little one like mine, but I will write because I need to dump all of these words and thoughts out of my head. I need to keep a record of our days and experiences if for no other reason than that I want my kids to have it. So, I suppose, it doesn’t really matter if there is anyone here reading this as long as someday in the future the kids do. I know I have said this before but this was meant to be a journal of our homesteading experiences and this year has been real short on the homesteading bit. 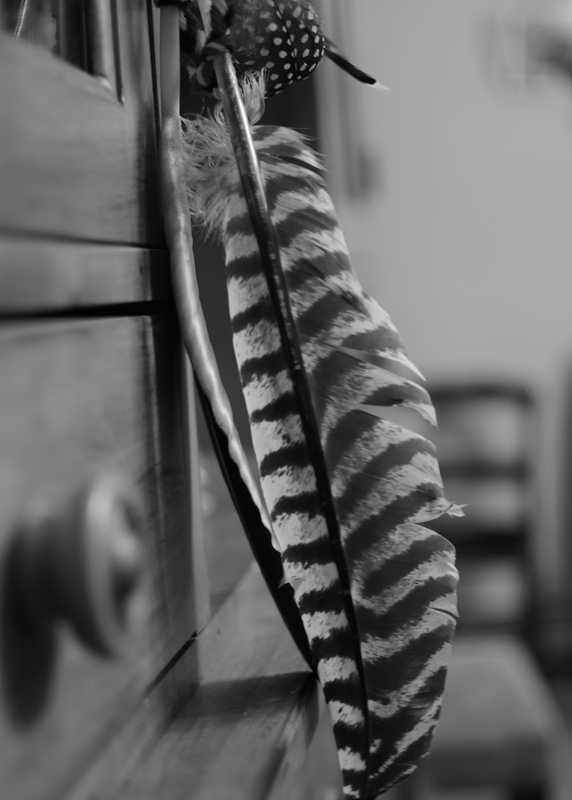 I mean, we are still here, still chopping firewood and moving sheep, still butchering our own animals for food, still pulling a plant or two out of the ground to grace our dinner table but it all seems far and few between and certainly not noteworthy enough to write a post for. Really, what would that look like anyway? We woke up this morning and walked the 10 sheep 10 feet from pasture 1 to pasture 2 today. We harvested carrots for tonight’s dinner from our one and only row planted this year. Awe inspiring it is not. So rather than manufacturing posts and scraping together a few pictures, I just avoided it all together. Spring and Summer around here were spent mostly in doctors’ offices, either for my issues or for pre-op, op, and post-op (which in the end lasted months longer than it should have) on Kevin’s right knee. Our two biggest projects consisted of Kevin digging a new waterline out to our overwinter pastures (which took nary a long weekend) and him rebuilding our back deck, a highly boring job but one that had to be done, lest the whole thing went crashing down sometime this winter, buckling under the weight of two feet of snow. 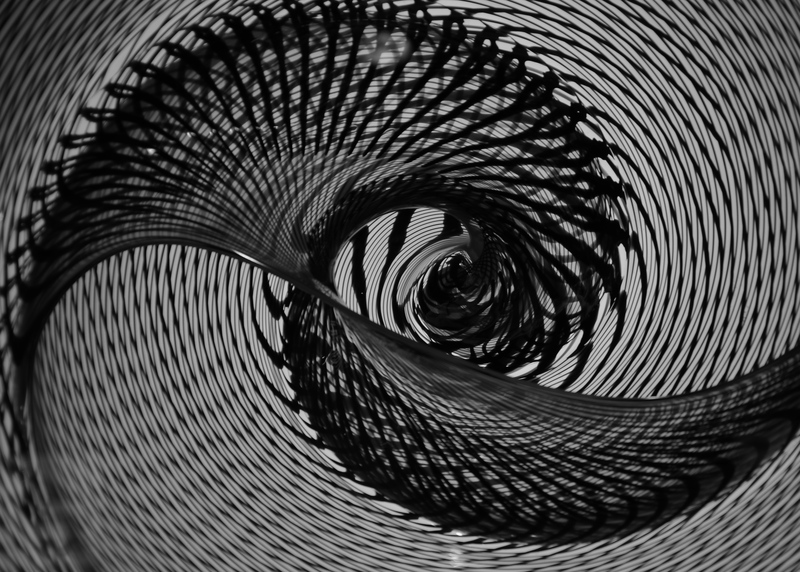 Of course, we still felt busy because while none of those things look all that impressive individually, string 1000 mundane moments together and they still take up a hell of a lot of time. Add in that half of those 1000 things involve an animal with an instinct, an agenda and a mind of its own you might as well multiply it by a million. On top of it all there are two little kids needing time and attention (Exhibt A: while just typing this I had to field a question from PJ as to what is actually happening when we burn wood in the woodstove. This led into a discussion of atoms, molecules, hydrogen, carbon, waste products, atmospheric gases, incinerators and how it all impacts the environment.) Granted, we got our science lesson for the week (month? next year?) out of the way but you can see how this might all make a mom (and dad for that matter) a little too tired to muster a weekly blog post. So what else is there to say? I have missed writing and all the cathartic side effects that come along with it. I have struggled with what to write about and how to walk that line of feeling like I have to share and sharing because I want to. I want to connect with other like minded people as well as people that can help me expand my mind. I’m not going to make any broad sweeping statements that I am going to show up here every day, or every week for that matter, but I do know that I want to show up. How that’s all going to play out I have no idea but I do know if anyone wants to come along I sure would enjoy the company. It was, all in all, a relatively calm holiday season. We visited, we ate, drank, laughed and reminisced. We gave gifts we produced right here on the farm or, at least, with our own hands. We weathered two below zero forecasts and two snow storms. I completed a goal of recording a picture a day in December, while at the same time cultivating some beautiful friendships with some lovely ladies who joined in, kept me company and kindly provided encouragement throughout the process. In the quiet pockets of time, between meals to prepare, waiting for visitors to arrive, caring for livestock and children, healing from one illness after another and contending with piles of snow, we brainstormed. We talked about what we wanted to plan on for the coming year, what we wanted to eliminate, what we had to do, what we no longer wanted to participate in and how to arrive at that oh so beautiful place we call balance. 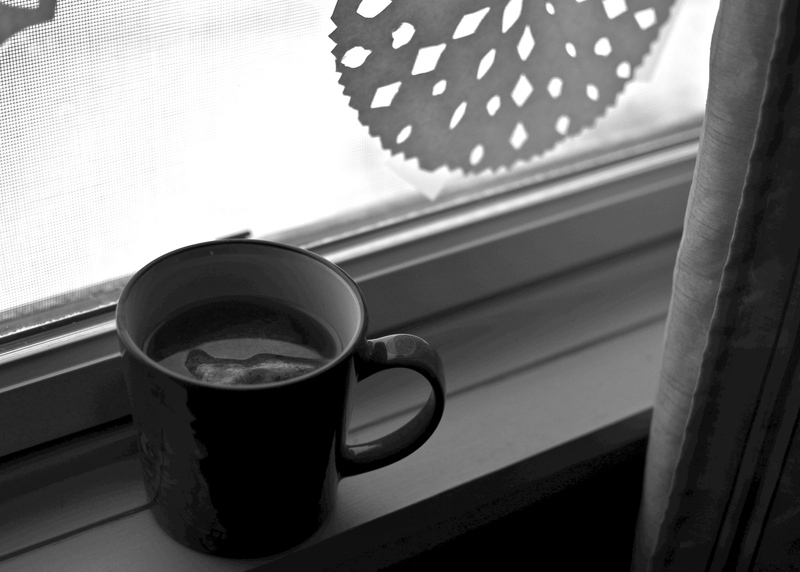 With the hurricane of the holiday season dissipating reality is becoming quite evident in the light of the new year. 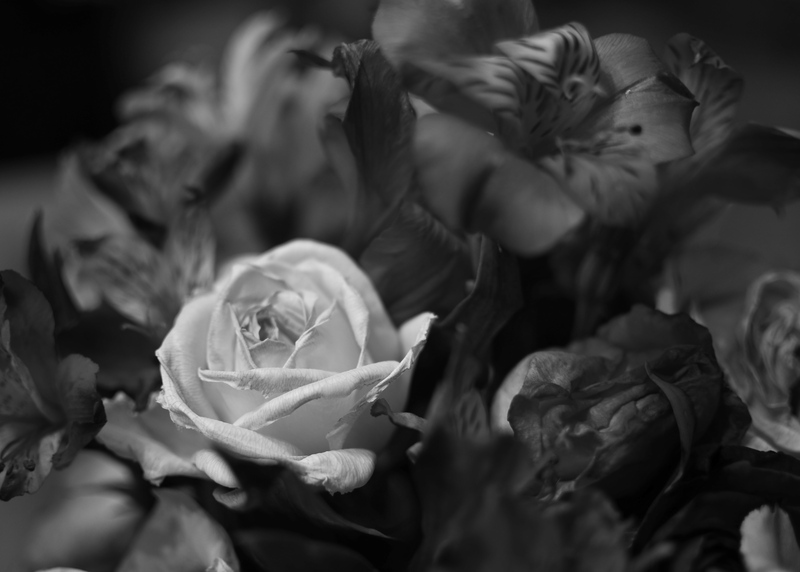 I am not getting better…yet. My Hashimoto’s is actually progressing rather than remitting, as are my symptoms. The past few weeks are apparently going to take sometime to recover from, evident in the fact that today I didn’t drag myself from bed until late morning, spent most of the day under a blanket, on the couch, snuggling with either a puppy or child all while dirty dishes laid waiting to be washed, laundry baskets overflowed and decorations begged to be put away. I barely even touched my latest knit project (which is very unlike busy-minded me.) With each passing day it has been a little bit harder to get out of bed in the morning, my joints have increasingly ached, throbbed and swelled, my mind has become more sluggish and my mood has swung sadly low again. The worst part is the normal healthy me is trapped inside this wasted, sad excuse for a 31-year-old, watching it all plummet and feeling as though she can’t do anything to stop it. I think I did a fairly good job of hiding it throughout the season. However, those of you who visited might not necessarily agree. I know while we ate very well at most meals, I did indulge in more sugar and refined flour than I would have any other time of the year. I also slept less and was on the go more, which probably hasn’t helped. Many changes are being instituted in the hopes of relieving symptoms, maybe, if I am lucky, reducing my antibodies, but they are going to have to be big changes that require a lot of support, often readjusting of everyday occurrences and instituting of new habits. Circumstances have drastically changed since our move here two years ago. Not only am I less than helpful with our usual farm task, leaving most of that on Kevin’s shoulders, but our attention is now desperately needed in places that are, albeit just as, if not more important than our dreams of homesteading and self-sufficiency. So the short of it all is, things are quickly being recalculated and rearranged in order for Kevin and I to have the time and energy to continue raising the kids in the way we had always intended and something has to give. That something seems to be the majority of our homesteading lifestyle. Sadly, I am selling almost all of my sheep herd and as of Saturday 10 will already be off to their new homes. I am just not physically capable of tending to a herd of 20, nor am I able to process as many fleeces come March. It also seems unfair for their care to fall mostly to Kevin, as it is his least favorite job here on the farm. (Most of our sheep are just that, sheep and with the exception of about 6 they tend to do the opposite of what we want them to.) So, we are aiming to sell most, butcher a few and, for now, keep only 4 ewes as pets/lawn mowers/fleece providers. 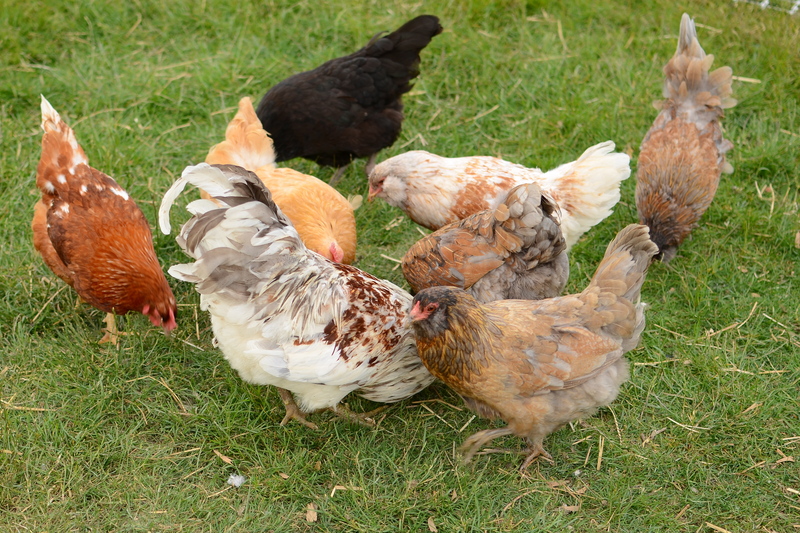 We are also selling or culling the majority of our laying hens. 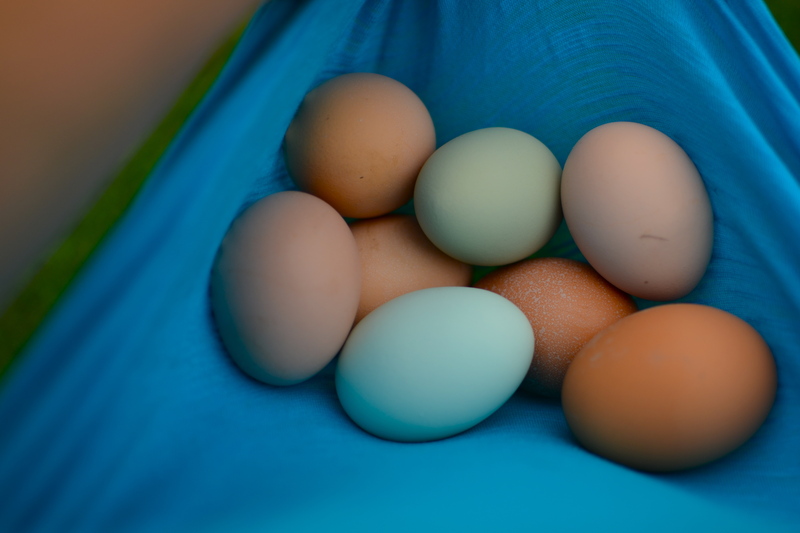 The plan is to put some meat in the freezer, decrease the amount of feed and care needed and keep only the best layers to meet our personal egg needs. Then we will add in maybe 3-6 new chicks to replace those layers next year. It will also mean a new, smaller coop, closer to the house which will facilitate in the kids and I easily taking over their care (no matter how I feel on any given day) and relieving Kevin of that chore, as well. Thankfully, none of the cows ended up being bred this past summer (Yay, for the combination of being too busy and having a little bit of brain fog thrown in) so we do not have calving to worry about and the herd was already due to be decreased with the butchering of one steer in spring and the second in fall. We are also considering selling the three girls if things remain the same by late summer. 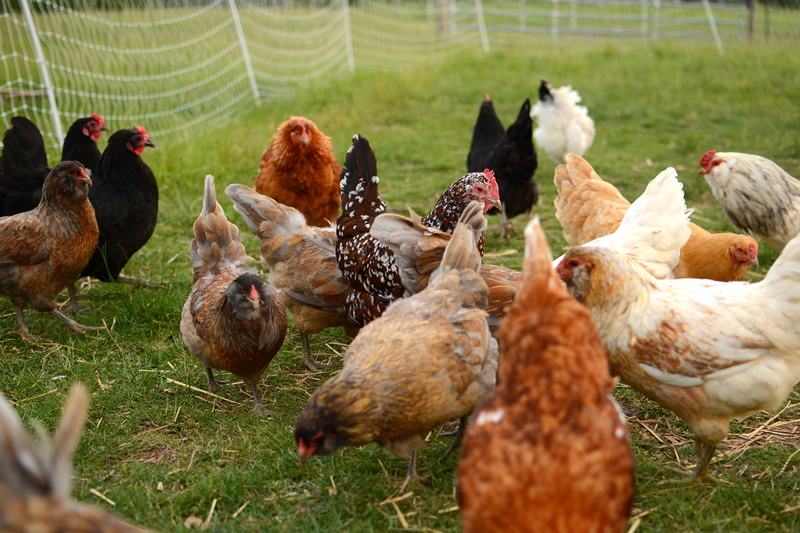 The ordering of two more pigs and a batch of meat birds has also been put off and we will be forced to outsource those meats to other local homesteaders and farms, along with our milk needs. That will leave us with our goat heard, which are fairly easy keepers, and our garden/orchard. The garden planning has not yet begun but I think I am going to have to force myself to keep it even smaller than last year and possibly supplement by buying a CSA share. It is sad because we have all of this land and all the possibilities it holds and we are now back to living a not so self-sufficient life. I am beyond frustrated and swing from beating myself up for seemingly failing at our dream and curling up in bed wishing we had never tried. I have so many things I want to do, learn and become better at (as does Kevin and which I wish I was better at facilitating, or better yet, not interrupting!) but I can’t make my body or our current life situation mold to those needs and head in that direction. I am also a little sad because I feel like this blog will no longer have a voice. There won’t be much homesteading occurring for at least awhile and that is really what the space was supposed to be all about. I do not yet know what the future holds for my writing here. Maybe a different blog? Maybe some time away while we regroup? I really don’t want to stop writing, photographing or sharing as it feels cathartic and I have met so many beautiful, wonderful friends through it, but this doesn’t feel like the right place to air all of that. Then again, maybe this is just another chapter in our story that needs to be told? So, how does one arrive at a place of acceptance when they feel like their body is abandoning them and their self is mostly unrecognizable both physically and mentally? Or when their dreams, at worst, fall apart around them, or, at best, get put on hold for an indefinite period of time? They feel sad, they cry, they get angry and they ask why. Then they wake up and pull themselves out of bed and start making an alternate plan. They sit across from their husband and talk about it, all day if necessary, until his outer dialogue becomes her inner dialogue because, heaven knows, the awful words she has been telling herself are not helping. And then we make a plan, one that allows everyone to work on healing, keeps the kids from getting lost in what was becoming a manic shuffle and keeps an eye on that thread of a dream, until another day, when we can pick it back up and weave it into our lives again. January is Thyroid Awareness month. 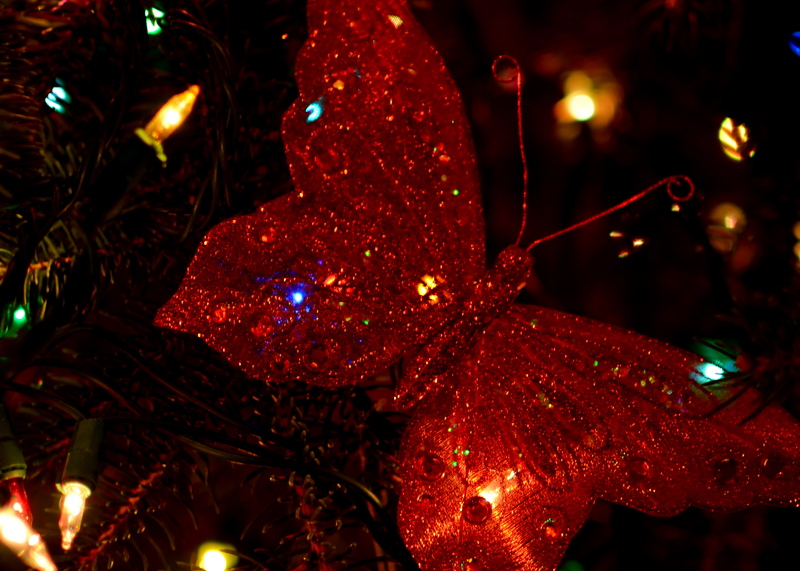 The butterfly is the symbol for thyroid awareness (as the gland is shaped as such.) My mother-in-law gave this ornament to S and left it nestled in our tree (yes it is still up) and I found it there earlier today. Approximately 1 in 1000 people suffer from Hashimoto’s Thyroiditis, a disease that is, at least, 10 times more common in women than men. It is also a hereditary disease. Please go here to familiarize yourself with the signs and symptoms of the illness because chances are someone you know is suffering. 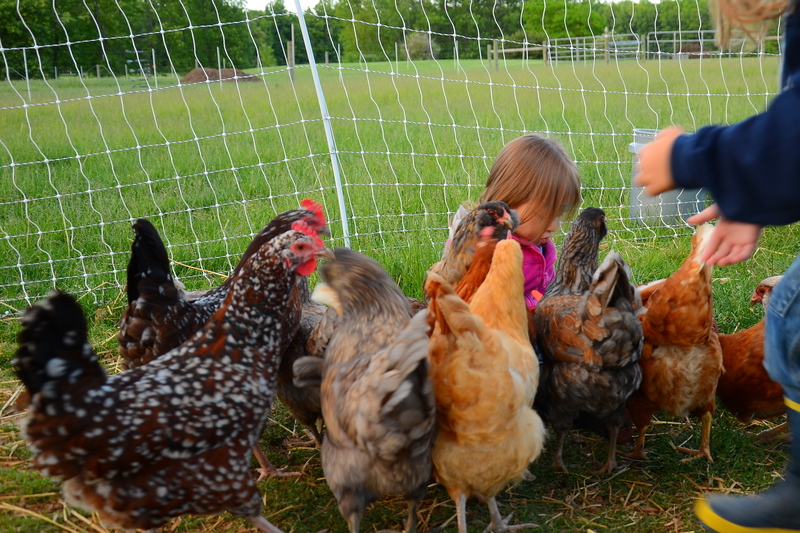 It’s no surprise that one of my favorite things about this farm life of ours is keeping laying hens. 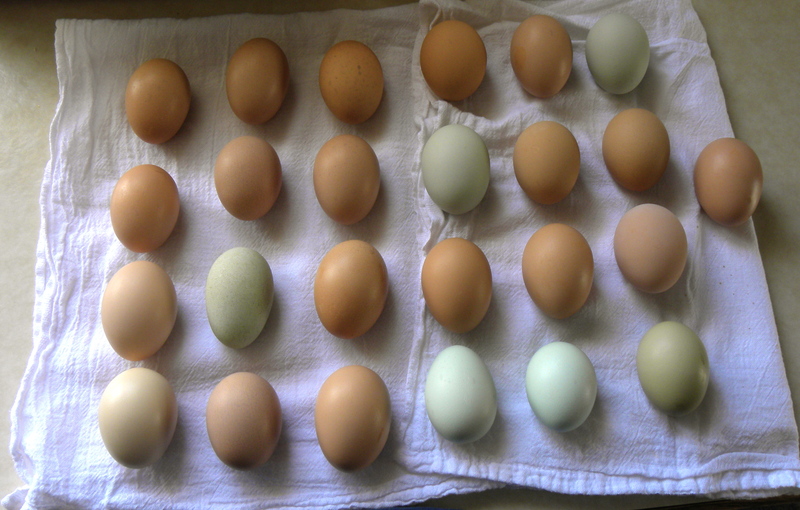 I also love the routine of going out to collect eggs in the morning and opening up the coop for day. Any day that starts by collecting breakfast right out of your backyard is going to be a good one! I am fairly certain, over the seemingly short time of this blog’s existence, that it has become quite apparent that I am a recovering Type A personality. I fight the need to have everything “just so” on a daily basis. I tended to spend hours mapping out any given action, as well as all its possible outcomes. Up until becoming the mother of two (because really, let’s be honest, now it’s just about surviving the day) I was notorious for being over prepared. “Oh, it couldn’t have been that bad” you say? Well here’s an example, our wedding had an itinerary, which was broken down by the hour for the entire day, so everyone knew where they were suppose to be and when. Kevin also had a list of all the luggage and other bits he was supposed to deliver to the hotel we would be staying in the night of the wedding. To answer the questions I know you are dying to ask, yes, Kevin’s family still makes fun of me for it and yes, Kevin still forgot a piece of our luggage which we had to drive back and retrieve before leaving for our honeymoon. 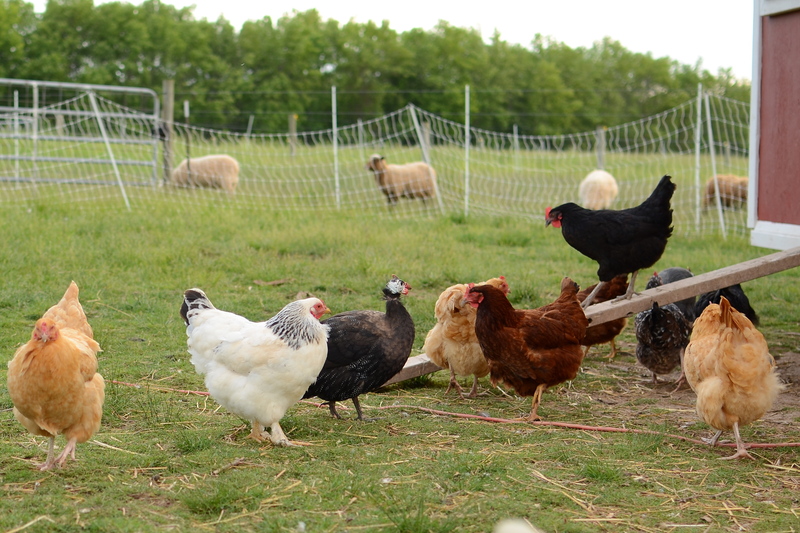 Anyway, I am sure you are wondering what this all has to do with our chickens. Well, you see, when we initially ordered the laying hens Type A me ran through all the scenarios. They mostly consisted of buying 40 hens, them not imprinting on the coop and never coming home the first night and in my mind every coyote, fox and weasel in the area would be stopping by daily for a snack. 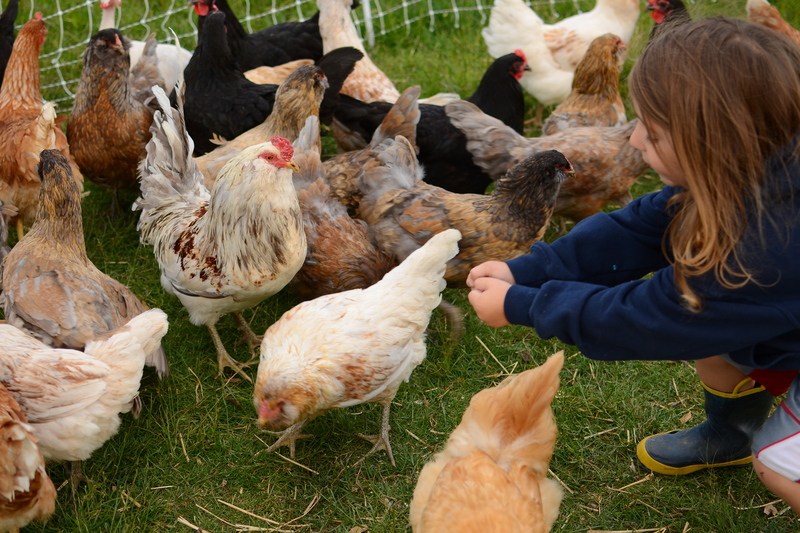 We bought movable electronet poultry fence, Kevin built a huge chicken coop, which sits two feet off the ground and on wheels with car jacks attached to each corner to aid in stability when parked, allowing us to move it to new grass within our fenced in pastures when needed. We religiously tucked them all in at night, which at the beginning often meant catching one or two with Kevin’s bird catchin’ net, or what most normal people would call a pool skimmer. 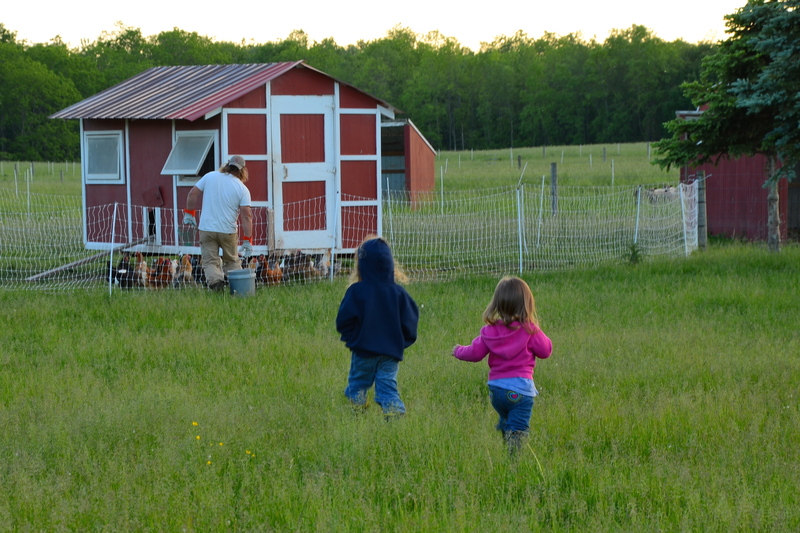 Nothing could dig into the coop, most likely nothing was going to traverse two layers of electric fencing to have chicken for dinner, however, we also felt like we were constantly moving a gigantic, and what turned out to be cumbersome, chicken tractor and chasing chickens indoors every night. 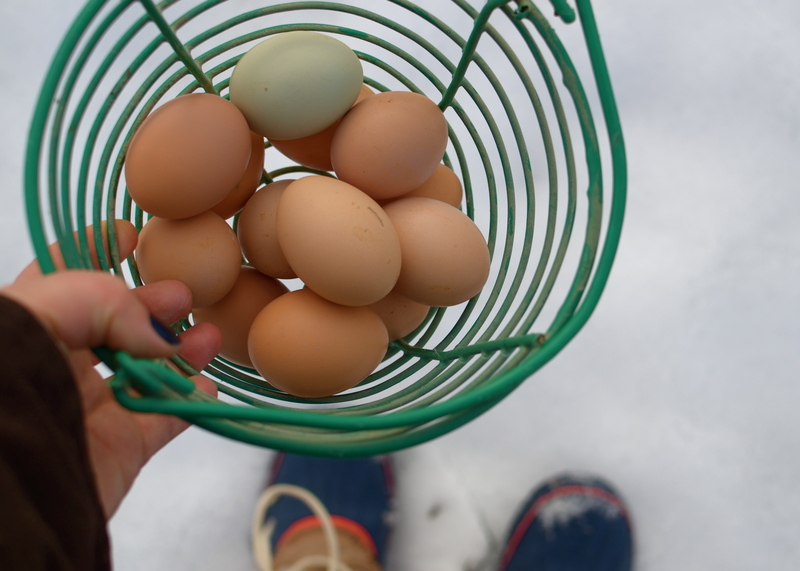 Fast forward to this spring and we had a few dozen chickens who had entered winter laying over two dozen eggs a day and were now limping along with only a few eggs daily, even though the daylight hours were increasing (hum, maybe I should refrain from writing posts like this one and unwittingly dooming us.) They had plenty of food and water, a freshly cleaned out and re-bedded house. No one looked sick, there was no predator pressure and our two roosters were doing an excellent job of gathering everyone up at dusk and tucking them into bed for us. There was no reason for them not to be laying dozens of eggs a day and they all looked a little extra ruffled and seemed to be scuffling with each other a little bit more than usual. 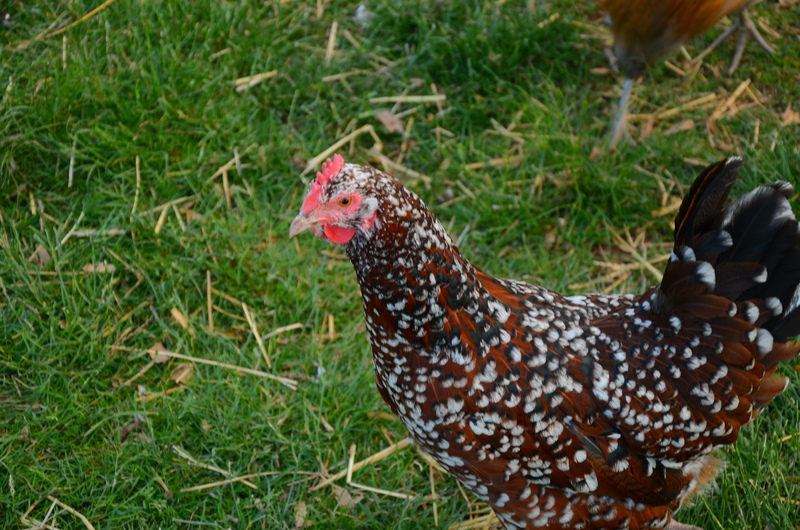 One day while preparing dinner and looking out our kitchen window, which has a view of our front pastures, I witnessed our one and only Brahma hen running frantically from one end of their fenced in area to the other, worm dangling from her beak and about 25 other chickens chasing after her. 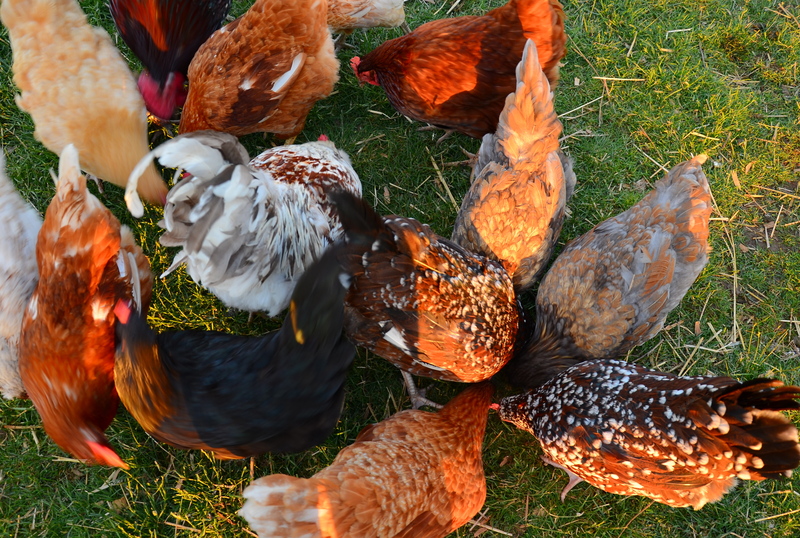 What followed was a scuffle, the Brahma frantically swallowing her snack, some random pecking and kicking and a bunch of chickens retreating to either under or into the coop. I got to wondering if they were just acting up and fighting with each other because they didn’t have enough space to wander in. They seemed to be acting like siblings who had been stuck inside for too long with too much energy and no way to release it and, in turn, decided to take it out on one another. The worm incident seemed to be that classic fight of “I want what she has and even though there are 20 other toys, I mean worms, on the ground no other than her’s will do!” So despite my concern, and control issues, we decided to take down their fence, trust that the boys would get everyone in at night and let them range as free as it gets. Almost immediately egg production steadily started to increase, everyone started to look sleeker and shinier and fighting reverted back to minor squabbles only once in a while. 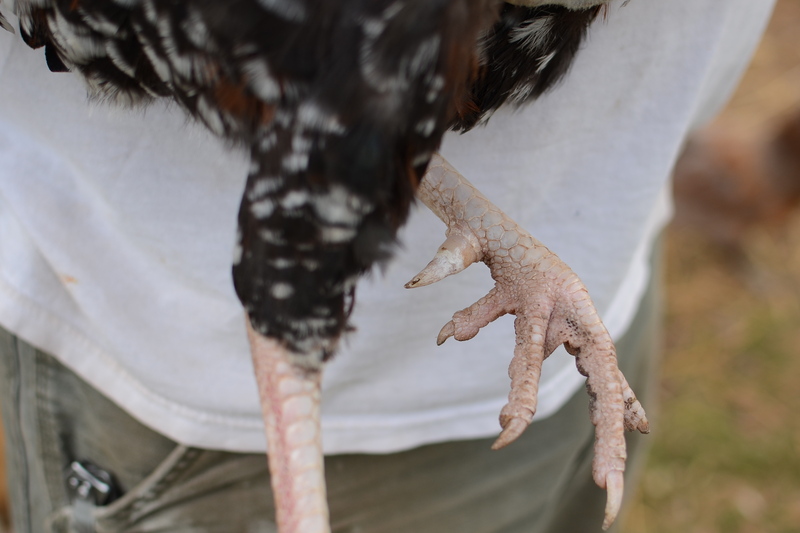 As of today, no one has ventured out of the pasture that the coop happens to be parked in, everyone marches into bed at dusk and we even witnessed our Speckled Sussex rooster, Brewster, calling everyone in when a particularly bad storm was blowing in. 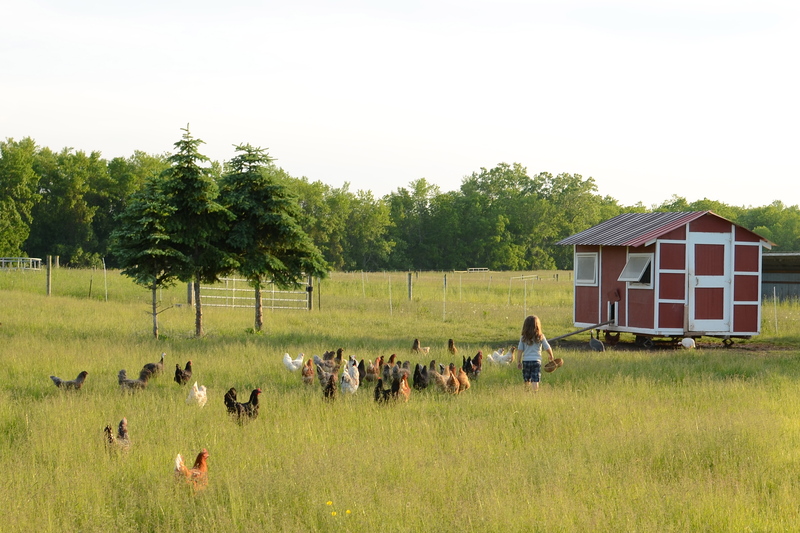 * Now we can roll the chicken tractor into a larger pasture and not have to move it within the week. Best of all, we no longer have to tangle with the electronet fencing every few days. I am shocked at how happy and content they all seem to be now and even though they have the whole world opened up to them they seem satisfied with taking just a little bit more space then they previously had and have shown no need to wander too far from home. Ah Ha! Another unlikely lesson in parenting learned thanks to farm life, I’ll be sure to file that one away for later. 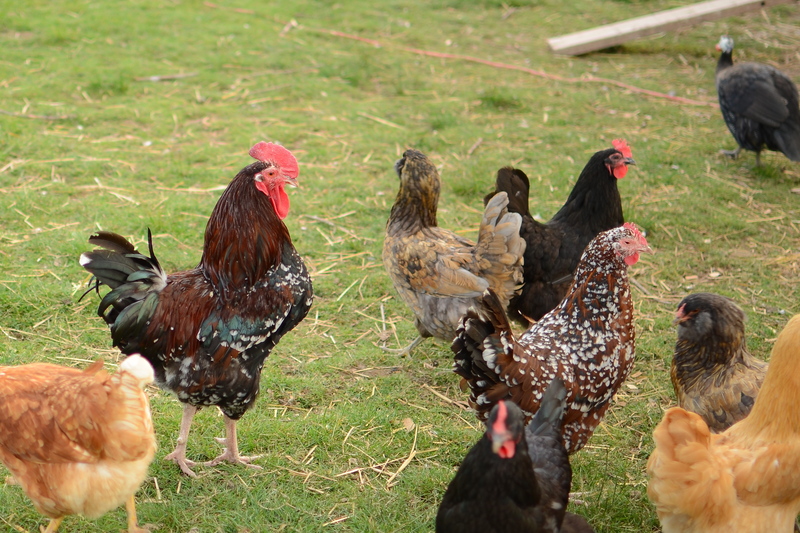 All of this did get me thinking, if my well-loved chickens were unhappy with just a quarter acre of space versus the full acre (and no fences) they have now, what do those poor chickens, who are crammed into hot huts with no windows, not to mention zero access to fresh grass to graze upon, feel like? Well, I suppose there in lies the truth of it all, this is the reason we make the sacrifices we do, to live this back to the land life of ours…we were simply in search of a happy egg. * This is what happens when the kids are in charge of naming and the oldest is going through a “everything I say must rhyme” stage. 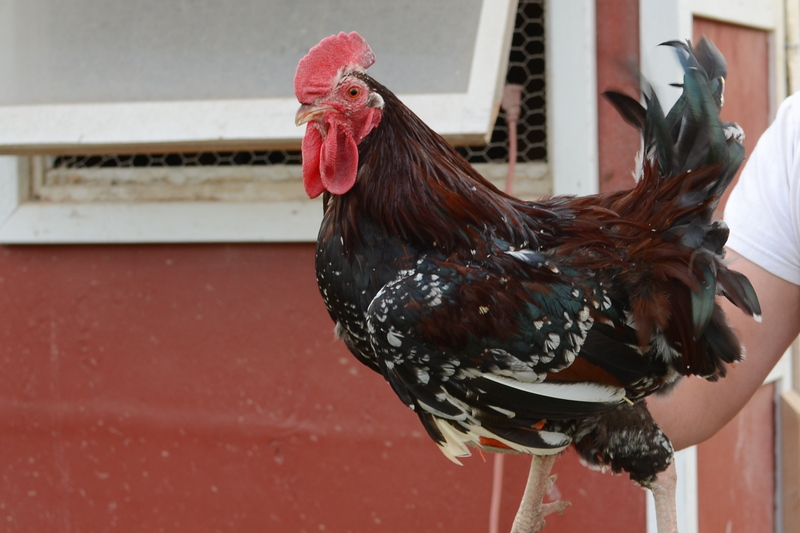 Also, our Americauna rooster is named Wooster. Just wait until you find out what they named the new calf. I LOVE eggs! My favorite breakfast, of all time, is Eggs Benedict but I will eat them any way I can get them. When I was pregnant with PJ my major craving in the second trimester was scrambled eggs. At first they were the only thing I could keep down as I emerged from the awful period that was the first trimester of my first pregnancy. I ate them every day, sometimes for both breakfast and lunch, until other foods began to sound appetizing again. 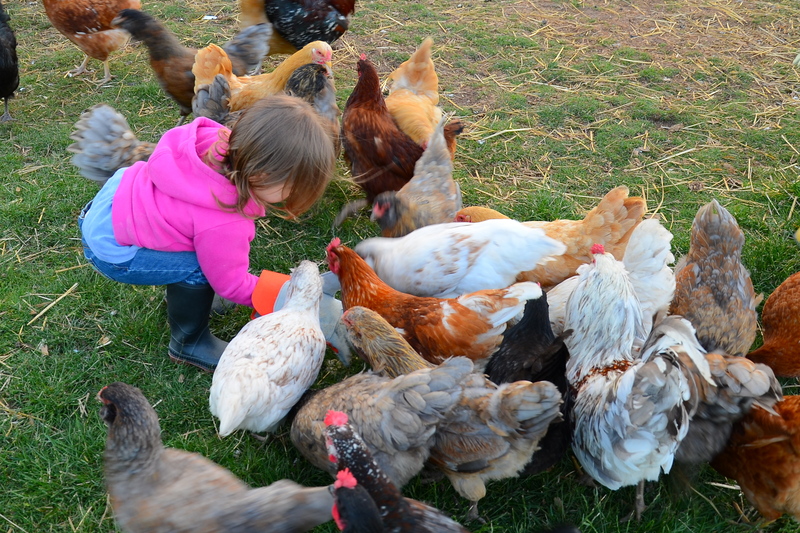 When we first came here the thing I looked forward to the most was getting our laying hens. 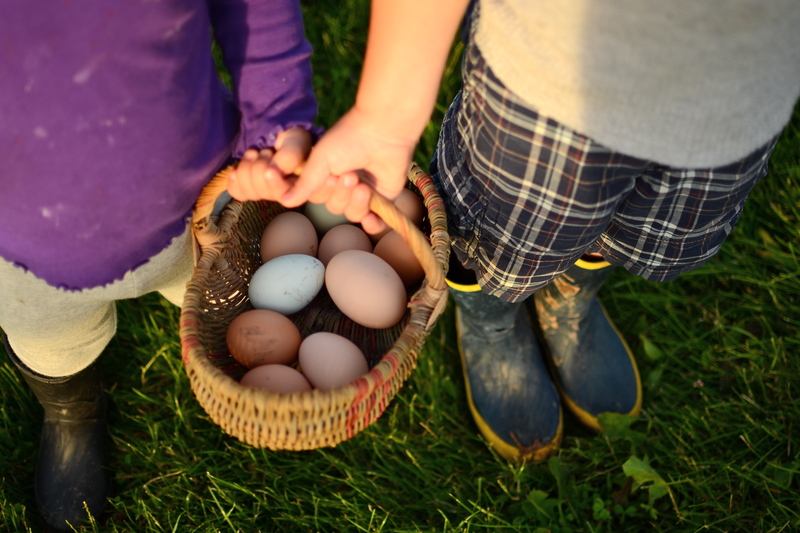 Being able to walk outside and collect all the eggs we could eat, for only a fraction of the store bought price, was quite exciting. Not to mention, our eggs would be healthier and more nutritious than eggs sourced from conventional or even large organic conglomerate (and supposedly pastured) farms. The day we got our first egg (a brown one) I was excited. The day we got our first Americauna egg, well then, then I was ecstatic. Not only are they tasty and good for us but they are cheery to look at. I will never tire of all the different sizes, shapes, hues and speckles or the unexpected excitement of perusing the nest boxes, gently nudging the lazier hens out of the way, to find what they have to offer us both morning and night. Unfortunately, we are having a similar problem to the Great Tomato Influx of 2012…instead this time we are drowning in eggs. Yes, I see a recurring theme of me, getting overly excited about each new venture, dreaming a smidgen too big, over extending us in the process and then having more of a yield then we can reasonably use. Humph! Thanks for passing that characteristic down to me Dad. 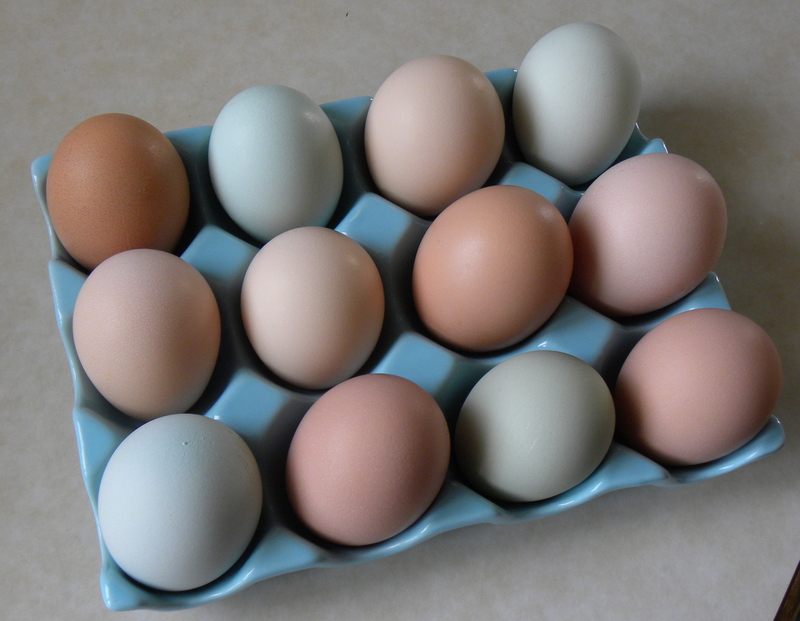 Originally we had intended to sell eggs but have had a hard time finding a large enough outlet to sell all that the girls can lay, minus what we can use ourselves. 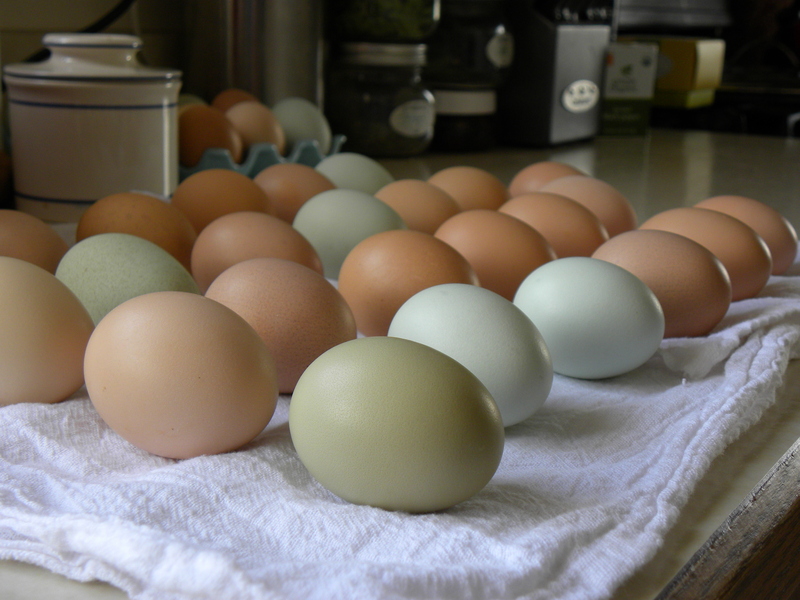 Even though we have shut off the lights in the coop, and spring has most definitely not arrived around these parts, we still have dozens of eggs leftover and the girls continue to lay about a dozen every three days, even without their extended daylight conditions. So I have searched the internet for every egg using recipe I can find. We eat egg salad often. Inhale deviled eggs 2 dozen at a time. I make all forms of custard desserts on a fairly regular basis. I’ve become a pusher of scrambled eggs, eggs over easy and poached eggs for breakfast and try to throw in a Quiche or Strata for dinner at least once a week. I am not “egged out” yet (probably never will be) but the rest of the crew seems to be over them. If all else fails, and we don’t get to them before they start to turn, they are destined for the pigs’ slop bucket. Seems like a waste of good eggs to me! I need inspiration. I need recipes. I need someone to buy all of these darn eggs! 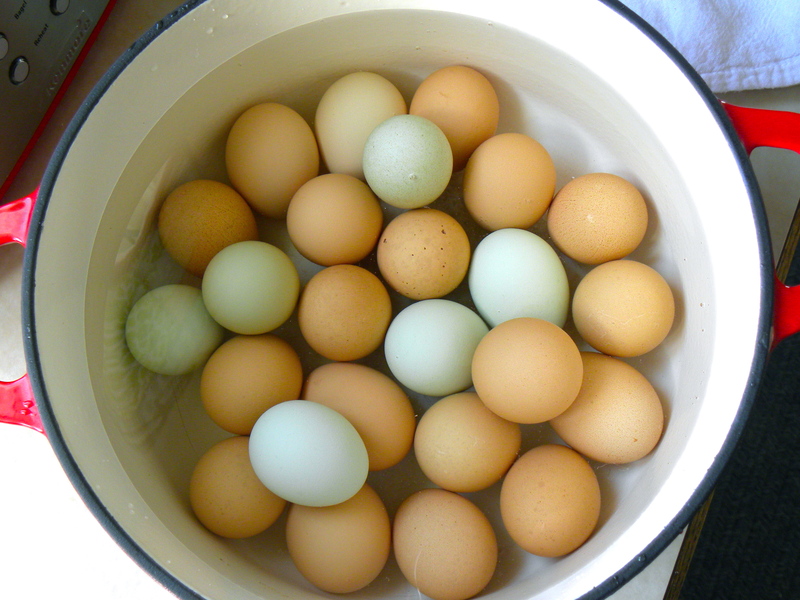 What recipes can you share that would use a boatload of eggs? Because a boatload is most certainly what I’ve got.